Simply Deeptima | Beauty and Lifestyle Blog: Beautiful Sunset inspired Nail Art !! 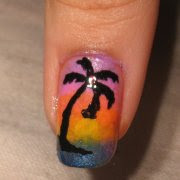 Beautiful Sunset inspired Nail Art !! hi !! after gazing at my nail polish bucket for hours i thought of using as many colours as possible... i love pink and purple a lot... suddenly i came up with this design and so far this is my favorite nail art. here is how it looks.. if u want to get it on ur nails and impress others.. here is how u can do it !! hope u njoyed the tutorial !! see u soon ! !